One barbarian prophecy says the legendary hero Bishortu will unite the three warring tribes. Another tribe has a prophecy that directly contradicts this, and they want Bishortu dead. And a third tribe, which may or may not be comprised of werewolves, refuses to let anyone know what their prophecy says. Meanwhile, the Duke on whose land the barbarians sit wants them all gone. In the middle of all of this is squire Terin Ostler, who has been mistakenly identified as the great Bishortu. Under the Duke’s orders to get rid of the barbarians, he heads to their lands without the slightest idea of what to do. Along the way, he has to avoid crazed assassins, rabid werewolves, lovesick barbarian princesses, and confused goblins while attempting to figure out the meaning of the magical and mysterious Wretched Axes. Nobody said being a hero would be easy. 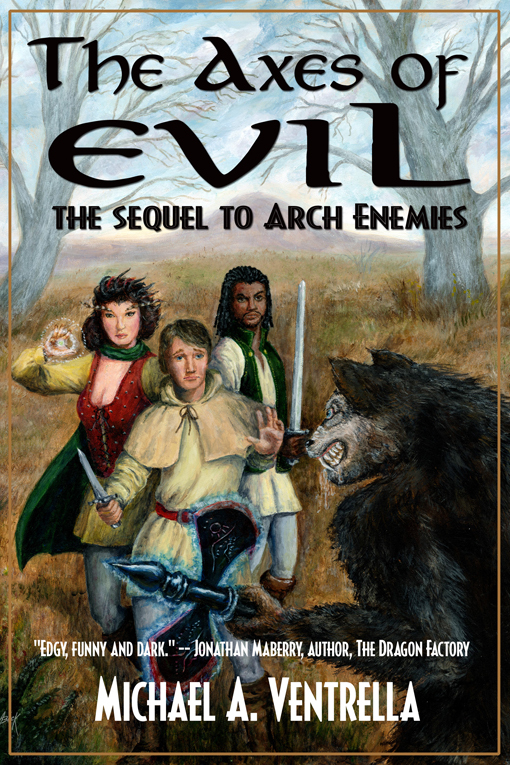 “The Axes of Evil continues the story that began in Arch Enemies. 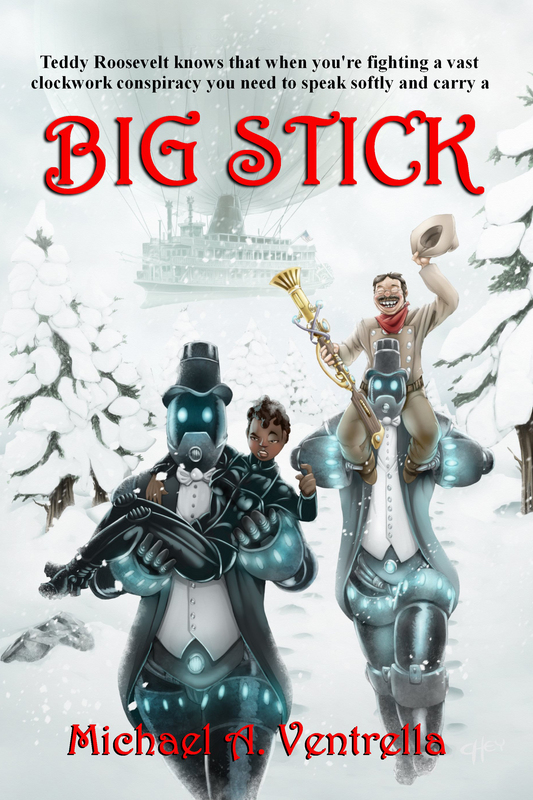 In this one, Michael Ventrella weaves another of his perplexing tales where it seems his protagonist, the squire but would-be bard Terin Ostler, cannot succeed in solving one problem without betraying another. Terin is now a squire of Duke Aramis of Ashbury – albeit a very new and unskillful one. His companion squires are Darlissa, the biata, from a race of magic skilled but enigmatic people created by gryphons, and Rendal, a skillful and brave normal human. Terin would much prefer a peaceful life but as in the other story, events seem to swirl around him. He wonders why he keeps being featured in prophesies which all lead to troubles that appear satisfied only by his death. The prophecy in the earlier tale was cryptic in that he was required to fulfill it without ever being able to see its contents – a conundrum deliciously solved in the finale. In this tale he is Bishortu, of whom three conflicting but secret prophecies are told and which he and his companions have to face many dangers to learn. We meet the three tribes of the Vansir who live in a sparse and rocky land they call the Vansir Reclaim. Each of the chieftains has one of the three magic axes which have kept the tribes separated and at war with one another for many generations. The goblins also live in this inhospitable land – also perpetually at war with the Vansir. As Bishortu, Terin is expected to solve all the problems before the armies of Ashbury arrive to destroy them all. “Once again, Terin is a part of a prophecy – well three prophecies to be exact – and and this time the prophecies are not as clear. One says he will unite the Vansir tribes, one says he will destroy the people, and the final, well; no one will speak of it. Suffice it to say, it is revealed, but I will let you find out what it is, which is actually pretty funny and well worth finding out. This was a very enjoyable read and moved much better than Arch Enemies did. The differences were the lack of need for character introductions and more direction for the characters to take. I found myself more engaged with this book and wanting to continue to see what happened next. The characters are more fleshed out with this one. Even the side characters were a joy to read.